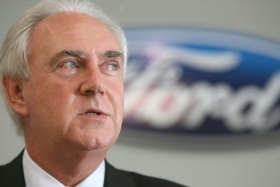 Ford of Europe boss Fleming wants customers to get money to scrap old cars. BOCHUM, Germany -- Ford of Europe CEO John Fleming called for EU leaders to do more to help the crisis-hit auto industry. "The European Union has so far failed to do enough to help carmakers facing a car market running 5 million units below last year's levels," Fleming said at an industry event here. Fleming said a united European response is needed to maintain a competitive automotive manufacturing footprint in western Europe before it melts away in the current unprecedented economic crisis. Fleming called for Europewide incentives to encourage consumers to swap their old cars for new models. In Germany, car showrooms have been filled with buyers in recent days after the government announced plans to issue certificates worth 2,500 euros to buyers who scrap cars that are at least nine years old. "The weakness of the response at the European level compared to the relatively energetic responses at national level is a disappointment," Fleming told an annual symposium organized by the Center for Automotive Research. Measures by individual countries would not be enough to combat the current crisis. "It seems that we can succeed when it comes to defining the essential characteristics of cheeses or sausages but not for a sustainable auto manufacturing sector," Fleming said. "I believe we need an effective industry policy for our sector across the EU. Brussels and Strasbourg need to understand that a strong auto industry is at the heart of a strong industrial policy, which in turn should be a keystone of the European economy."